ST. CLOUD, Minn. (KSAX) - Canoe enthusiasts, Todd Foster and Scott Miller are getting ready to paddle their way down the Sauk River. Their 8-day, 125-mile trip from Lake Osakis to St. Cloud starts Sunday. The two have been canoeing for years, including a 110-day trip from Foster's home along the river in St. Cloud to the Hudson Bay, and now they want to share their experiences on the water with others. "Let’s get people out paddling,” Foster said, “I tried to figure out what the barriers of people to paddle, and one of the big barriers is having the equipment. There are not many rental places in the area and even if there are, they cost money." Foster, a member of Friends of the Sauk River raised money with the group to start a free “Canoe Library”, which is available for anyone that wants to give it a try. 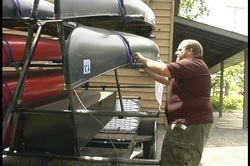 "We raised enough money to buy six canoes, a trailer, and paddles. Everything you need to go paddling on the river,” Foster said. Foster is also a member of the Sauk River Watershed District and hopes their trip and the "Canoe Library" will increase awareness. "I think the more people we get to use our water resources; the more likely they are to protect it. If you're invested in something, the more likely you are to protect it," Foster said. Foster said the best thing about the Sauk River is that it's right in our backyard. "You don't have to take a 110-day journey; you can take a two hour journey. That’s what this library is about, that's what our trip is about,” Foster said, “To inspire people just to get out and paddle." Foster and Miller will stop during their trip for, “meet-and-greets,” in Sauk Centre, Melrose and Cold Spring. Paddle the Sauk website has more information about the trip and the “Canoe Library”.